It wasn’t great. Alibaba’s (BABA) calendar third quarter earnings release saw revenues miss consensus while non-GAAP earnings had a strong beat. In addition, the fiscal year revenue forecast was reduced. It still remains to be seen whether or not a near-term slowdown in growth due to regional expansion will reap dividends in the future. Below are some key points from the earnings release and subsequent analyst call. Revenues of $12.4bn missed Wall Street’s consensus of $12.54bn in what was a rare miss for Alibaba. And while the trend of revenues looks to be exponential, it’s worth remembering that there have been several large subsidiaries added to revenues from income from equity investees, such as Eleme, Koubei and Cainiao. 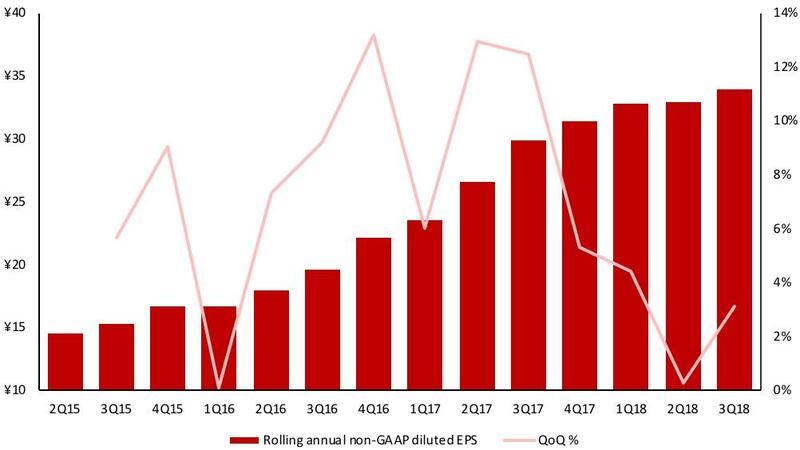 To compound this disappointment further, it’s the first time in three years that the firm has missed analysts’ expectations on revenues. As for earnings, $1.40 this quarter was well ahead of the $1.07 consensus, but it should be noted that earnings growth is slowing. The ramp up in growth seen during 2016 and 2017 has been followed by a slowing during 2018. This has been caused by slowing revenue growth and operating expenses that have been larger than before. A key point from the prepared statements of CEO Daniel Zhang is that the Taobao business is expanding further into rural China; something that has been going on for a while but likely accelerated by the rapid growth of Pinduoduo (PDD). In the most recent quarter, 75% of new Taobao customers came from these regions. On the one hand, it’s an important move for Alibaba. I don’t believe it can successfully expand its ecommerce platforms overseas, such is the dominance of Amazon (AMZN) and because Chinese firms have a long history of being strategically trapped within their borders. A quick look at Baidu’s (BIDU) expansion into Japan, Egypt or Brazil tells a common story. Therefore, by targeting new customers in China, it is a new revenue source. However, there’s an issue with this strategy because, as we’ve seen with Pinduoduo, these consumers have low annual spending on ecommerce platforms. 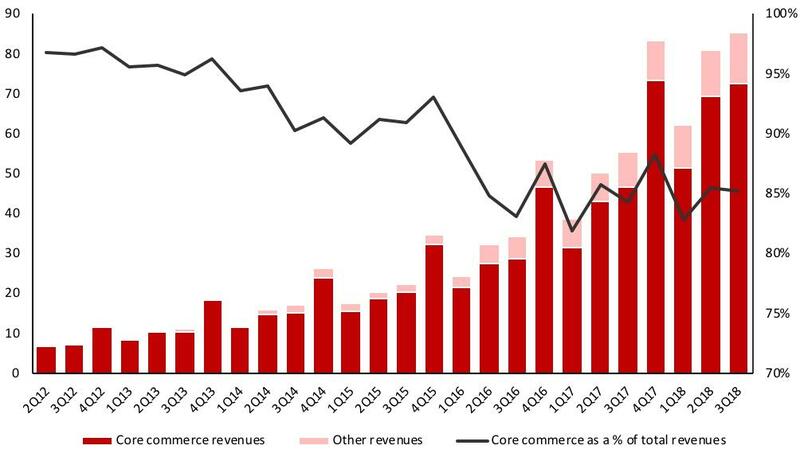 Pinduoduo’s annual spend per active customer is around 10% of JD.com’s (JD). 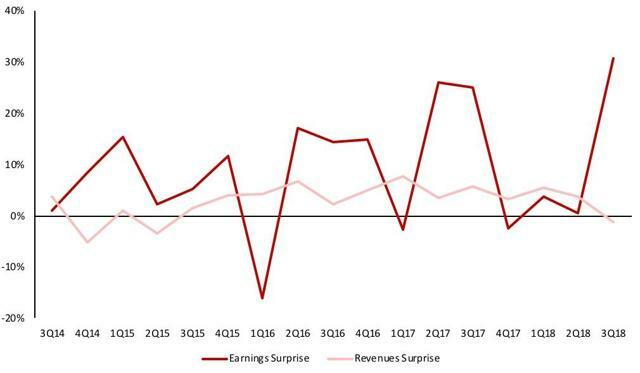 I believe that this has been a cause of the slowing revenue – particularly from China commerce – and the growing expenses, which have led to slower earnings growth. While not disclosed any more, I believe the effect is best seen in the firm’s monetization rate, i.e. the revenue generated from the average user’s transactions, which would be seeing slowing growth. I want to highlight an interesting relationship between Alibaba’s calendar third quarter China commerce revenues and Singles’ Day sales. Logically, it would make sense that lower-than-expected China commerce revenues in the third quarter would be due to consumers delaying purchases ahead of the big Singles’ Day sales event on November 11. Why buy in September when you can get a 30/40/50+% discount in November? In other words, there should be a negative correlation between China commerce revenues and Singles’ Day sales. However, that doesn’t seem to be the case. In fact, the correlation is positive. 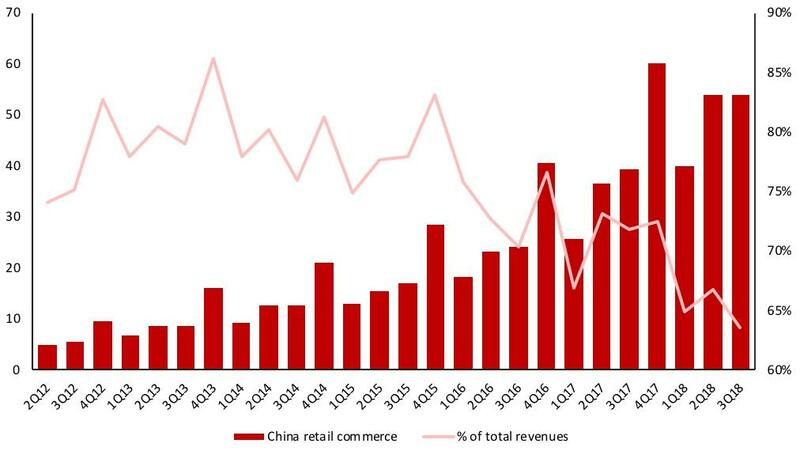 The growth of China commerce revenues in Q3 is similar to the growth of Singles’ Day transactions. 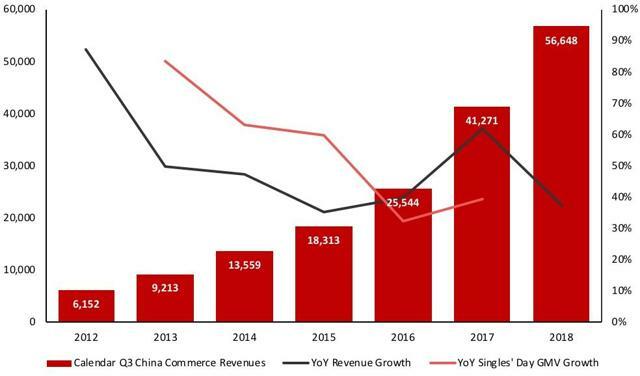 This is a disappointing sign for those – including myself – expecting a blowout Singles’ Day because a slowdown in annual Q3 revenue growth usually leads to a slowdown in Singles’ Day growth. Calendar third quarter China commerce revenues and their growth, as well as the year-on-year growth in Singles’ Day transactions. Units: RMB millions. Source: Alibaba investor relations. November 11 will be the day to see whether this trend holds. Readers can find my other calendar Q3 earnings previews and reviews of Chinese firms, asset managers and investment banks here. BRUSSELS (Reuters) – EU governments are divided over a plan to tax big internet firms like Google and Facebook on their turnover, fearing retaliation from the United States, and could delay its application until a global deal is reached, top officials said on Tuesday. But the plan, which requires the support of all 28 EU states, is opposed by a large number of them. The Commission’s effort to come up with a system to ensure internet companies pay adequate tax has been running in parallel with a study of the subject by the Organisation for Economic Cooperation and Development seeking a multi-lateral approach. “It is very difficult to see an agreement on the digital tax because so many technical issues are not solved yet,” Danish Finance Minister, Kristian Jensen, told reporters on the sidelines of a meeting of EU finance ministers. He added that the proposed EU tax was devised in a way that would hit mostly U.S. companies and therefore it would attract U.S. retaliation. “Of course there will be a reaction from the U.S.” he said, calling the tax “not a good idea for Europe”. His remarks echoed comments made by diplomats from several EU states, including Germany, Sweden, Ireland and Malta, in a meeting last week, according to EU officials. France, which has long been the main supporter of the tax, proposed in September a sunset clause, as a step to convince reluctant states. It suggested on Tuesday that it could support allowing more time to implement a new tax system, so that the OECD can finish its analysis. “There must be the adoption of a directive on digital taxation by the end of this year,” Finance Minister Bruno Le Maire said, using the term for EU laws. “There will be the question of implementation of the directive. We are open on that question, because we know there is work done by the OECD,” he said. EU states are discussing two options put on the table by the European Commission. The most ambitious plan would entail a tax on the turnover of digital firms imposed unilaterally by the EU before a deal is reached at global level. This approach is opposed by several countries, including small ones like Ireland where many tech firms book profits on sales in bigger EU countries. The second option, which has so far been sidelined, would revise the tax rules so that levies could be imposed on companies based on their “digital presence” in a state. This option would take longer to be applied and would be in line with work at OECD level. “We hope we can have a unanimous decision that will go down the OECD road,” Jensen said.